Episode of History | AMCON is the solution for sludge dewatering press and treatment. Business was started in a small house in Gohongi area which was 10 minutes on foot away from Yutenji Tokyu Toyoko Line station. It reminds you of the good old days in 70s, isn't it? As the business goes well, office was expanded and was moved to a place by the Meguro River which was close to the Nakameguro station. Cherry blossoms were beautiful in Spring but the flood control was not as advanced as now and Meguro River was often flooded in rainy weather. Office was even flooded time to time and according to someone who knows that time, the road got covered with water as soon as it started to rain. This year was also the time for great expansion and 22 new graduates joined the company. Originally, there were 10 people in the company, so you can imagine how busy they were at that time since each of them were paired with 2 new graduates. 8 minutes on foot from the previous office, first independent office building comprising three story with a basement was established. Rooftop was spacious and pleasant, and some of them would grow foliage plants, vegetables, strawberries and so on. Radio was always on in the office and they would listen to music while working. In Spring, they enjoyed cherry-blossom viewing by the Meguro River while having delicious cake from their neighbor "Fukusaya" pastry shop. As the sewage coverage rate increased, demand for septic tank maintenance service, which was one of the main business, decreased. Since number of apartment buildings increased dramatically at that time, we launched this new monitoring business to target them. Facilities and our office were connected through phone line and the alarm would go off automatically in case of any trouble so that people could be sent there urgently. To be more precise, service was about handling any issue with drinking water holding tanks installed in rooftop 24h/7. Hence, name AMCON 24 was originated at that time. They moved around Tokyo everyday by painted cars which were designed by them. Water sampling of drinking water holding tank usually installed in rooftop started. Until that time, only analysis and reporting had been covered and sampling was included in the scope this year so as to provide complete service. Team of 36 people mainly consisting of devoted sampling staffs was established and the sampling business started. Name was changed to AMCON INC. In 1984, which was the 10th year since establishment, "CI Plan" was launched internally. Service brand "AMCON" which was a part of "CI Plan" started to spread and interpreted internally as a group of technical specialists responsible for providing AMenity and CONvenience to clients. 3 years since the establishment of this service brand, name of the company was changed to AMCON INC. so as to match the service brand. Eyes in the logo mark symbolize "technique" and "trust" respectively and at the same time signify that AMCON will always keep their eyes on your facilities 24/7 through their remote monitoring service. In order to experience first-class service, company trip to Hawaii was organized this year. While staying at the luxurious Sheraton Hotel, sightseeing was done and marine sports were played. Having not totally forgotten about work, some visited home of the tour guide to see the structure of the drainpipe as well as disposer, which was not commonly used in Japan at that time. Founder Masaaki Sasaki took 10 years to invent VOLUTETM Dewatering Press. Patent was obtained in USA in 1994 and in Japan in 1995. First marketing activity focused was advertisement to let people know about the technology. They participated in as many exhibitions as possible to promote the new technology. Nevertheless, it was not easy to make others understood verbally how this machine could actually thicken or dewater sludge. So the demonstration was conducted for that reason. I guess not many would even consider this but sludge was actually brought to the exhibition from a sewage treatment plant every single day to demonstrate the machine. This idea eventually brought success and requests for demonstration gradually increased and busy time of days, running around all over Japan for demonstration, continued. Factory which was located in Machida in Tokyo was moved to Nippa in Kohoku district in Yokohama, where many small factories are located. Kohoku district after the end of war implemented a policy to utilize agricultural land for factory or storage base. For that reason, there are nowadays many factories especially around Tsurumi River, and the district became one of the biggest inner industrial area in Yokohama. "Making fertilizer out of sludge generated from wastewater treatment.... expectation for local production for local consumption..." If you look at the Dell Compo installed in agriculture drainage facilities, you can see how this expectation of the founder was met. "If there was a compact composter that fits in the existing facility, sludge could turn into fertilizer there. If so, sludge not disposed as industrial waste but could be reused for the agricultural land." Number of such requests from municipalities were received and the development of Dell Compo was started. However, it took so much time and effort to get to the final version of this machine. In the beginning, it was not easy to have stable composting performance and the person who was in charge would go to the site many times without rest. With such effort, specification of Dell Compo was gradually improved and it is still a long selling product nowadays. A research worker from Japan Sewage Works Agency asked us if low concentrated sludge could be dewatered or not at the exhibition where we were present at that time. This was the story behind the development of models for small-scale WWTPs. After having done experiment to confirm the basic performance for sludge from Oxidation Ditch in Niiharu village in Gunma prefecture, joint research with Japan Sewage Works Agency started in 1995 aiming to actually apply the technology for small-scale WWTPs. With help from Toyota city in Aichi prefecture and Nakanojo town in Gunma prefecture, long-term experiment (820 days of operation and 11,500 hours of operation) was carried out. Through this joint research, the person in charge was able to feel the potential of VOLUTETM Dewatering Press everyday, which kept him highly motivated. 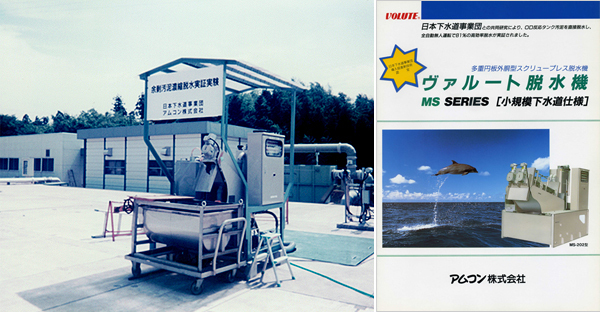 In July 2000, VOLUTETM Dewatering Press appeared in the facility standard specification of Japan Sewage Works Agency and was used by more and more customers. In agriculture drainage facilities in the heavy snow mountainous region, it becomes difficult for a sludge tanker truck to come to the site since the road gets fully covered with snow. For that reason, the sludge needs to be stored in the facilities and it was important that sludge volume be further reduced. In response, we shifted our focus on developing a small-scale sludge dryer which could match small-scale treatment facilities like agriculture drainage facilities. In the beginning, the dryer consisted of layers of drums installed horizontally, but unless the sludge was dry enough, would get clogged at the inlet and number of tests were carried out before the model was developed into the current one. Due to the amendment of waterworks law in 2004, (water quality standard determined by ordinance 101 of the Ministry of Health , on May 30th 2004) examination of disinfection by-product was enforced. Disinfection by-product is chemical substance which can be generated from chemical reaction which occurs between chlorinated water sampled from river and the organic material contained. Chloroform, formaldehyde, cyanide which are harmful to the human body are examples of disinfection by-products and they could increase the risk of cancer and cause neurological disorder. In our company, Gas chromatograph and ion chromatograph were introduced in response to the amendment of waterworks law so that thorough examination can be carried out. 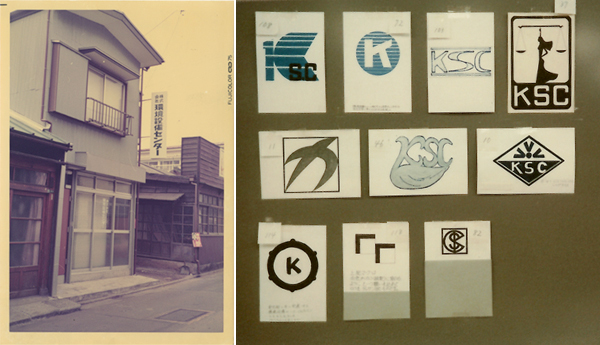 Headquarters building was built in Yokohama and so the base was moved from Nakameguro in Tokyo to Kohoku in Yokohama. Term "VOLUTETM" of our VOLUTETM Dewatering Press means "spiral" and the interior of the new headquarters building is actually structured in spiral shape. Each floor is connected through 3 to 4 steps and you will need to walk around the building to get to the top floor. New visitor for that reason always asks "how is the building structured?" with great interest. Then, this question is answered while walking around the spiral-shaped building. New employee also gets lost in the building at least once, so please visit our office at least once for your experience. Our wish to let everybody in the world know about our sludge dewatering technology and use it effectively led to the establishment of the manufacturing and sales base in Jiangsu, in rapidly growing China. Taking our idea "Chinese company for Chinese people" into an account, business was started with only Chinese members with a rented factory which was three times as big as the factory in Japan. No recognition of VOLUTETM, no clients, no local staff, no manufacturing knowhow in China, operation was started from scratch. Although some may consider such challenge to be reckless or thoughtless, thanks to the studious effort of the president and its local staffs, now the company is growing at stable rate. Making more people familiar with water analysis was the main idea behind the startup of "suishitsubunnseki.com" ,and once the site was set up, number of requests were received from people with no experience of water analysis and here are some examples. "Would you check the water in our well to see if it's drinkable? ", "would you find out if spring water can actually be sold? ", "would you check the quality difference between inlet and outlet water from our water server? ", "there is strange smell and taste in the water, would you find out if it is safe to drink or not? ", "would you find out the cause for our water pipe corrosion?" New interesting requests were received every single day. Not only general analysis but also any other special analysis is offered upon your requests, so please feel free to contact us. Through our experience in overseas market, we found that there are numbers of unbelievably large treatment plants there. "Is there any larger VOLUTETM?" number of such requests were received from the clients from abroad. Therefore, development of larger model with capacity as twice as big as the existing model was started in November 2007. But it was not just about making the diameter of the drum bigger according to the research and development (R&D) team. Having looked through once again the basic principle of VOLUTETM in details, going through number of trial and error, the new large model was developed in February 2009. In the same year in July, the first model was installed in a municipal wastewater treatment plant in Republic of South Africa. 300 Vibrant Monozukuri (Manufacturing) SMEs program sponsored by SMEs Agency of the Ministry of Economy, selects and awards SMEs with special technology from all over Japan. According to the selecting committee, "there are numbers of SMEs with advanced technology which are not very known. These 300 companies are the tip of the iceberg of various companies present across Japan." As for a company which manufactures and markets equipment which don't get caught by one's eyes in general, it was a very honorable thing to be selected as one of the Monozukuri SMEs in Japan. 3 years since the establishment of Chinese subsidiary in Jiangsu, various issues were salient in terms of doing business in China. As for the next step, production base was moved to Fujian. Although manufacturing of parts were outsourced until then, many new manufacturing facilities were introduced at this time to be more self-sufficient. Factory was build in a large 10,000m2 land and we still remember the pastoral landscape with herd of cattle walking around us when the first visit was made. Our subsidiary in Europe is based in Prague, Czech Republic which is located in the center of Europe. Until then, Product assembled in Japan was exported and delivered to our clients in Europe from Japan but considering the undesirable fluctuation in currency exchange rate, long delivery time by sea, high shipping cost, we decided to start local production in Europe. Not to mention, Czech people are also studious and kind. People often ask us "is it Czechoslovakia?" but in 1993, Czech Republic and Slovak Republic were separated and became independent. In March 2010, "ALL BRAND NEW VOLUTETM PLAN" was implemented to work on all the weak points of the current model. As a result of this plan, advanced VOLUTETM Dewatering Press VDC series was put on the market in May 2011. VDC series compared to the conventional model is designed to have stable performance in the longer time and the lifespan of spare parts was increased and their replacement cost was reduced. 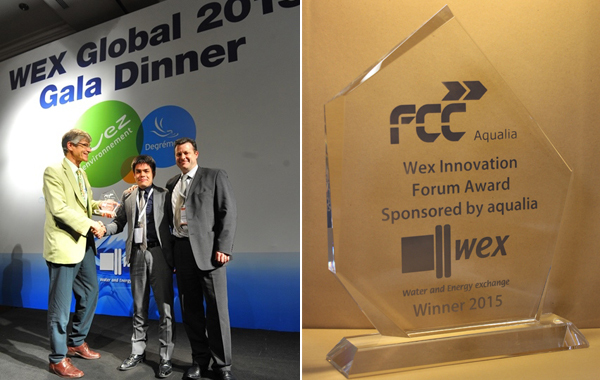 VOLUTETM wins Innovation Award at "WEX Global Forum 2015". "WEX Global Forum" is a business matching event in the industries of water and energy, held by a British company WEX once a year. This event, sponsored by multi-national companies in the industry, promotes innovation of technologies that will save the environment of the Earth. VOLUTETM Dewatering Press won the Innovation Award this year for its economic advantages, its technical performance, and the unique motivation of the invention, which was driven by previous experience of AMCON as a wastewater treatment service provider. The assessment was made based on the presentation made on the spot, and Mr. Richard Beagrie, the Sales Director of AMCON Europe s.r.o. who did the presentation said, "I was very nervous, but it was the most proud moment of my professional life." We also received the comment from Mr. Mark Barker, CEO of WEX, "Congratulations to Amcon for its VOLUTETM technology and demonstrating how to export and translate Japanese innovation through to the global market."